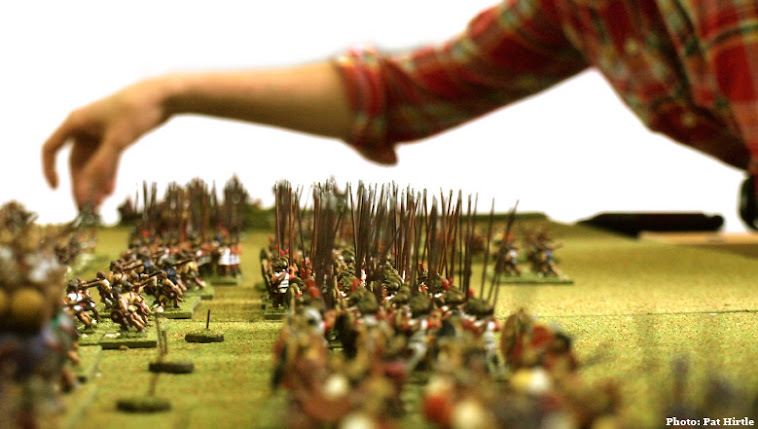 This year the Society of Ancients' Battle Day subject is Pharsalus. As I have the figures for it, we're going to do our own battle day at my place on the same weekend that the Society is holding theirs. We have six participants confirmed so far. I'd like to get one more so that I can act as umpire rather than player. As is usual with our games, there is a mix of people: a die-hard miniatures gamer from way back, a board wargamer who will play miniatures occasionally, two chaps who enjoy a game now and then, a new bloke into computer games, and myself. The day is actually approaching quite swiftly, so I need to get things into gear. The second step is to find the right rules. I have a few options here, but may even go back to using my own 'January Project' rules if I am able to umpire. The third step is to assign the players to the most appropriate command roles. If I do it right, I think we could just about have people who don't know the battle playing the Pompeians and those who do the Caesarians. I'll prepare a little brief for each player outlining their character, their troops, and their role in the battle. If there is time and opportunity I might also include some personal goals which can be used to determine the most successful commander on the day so that even a player on the losing team could win man of the match. Lots to think about, and a bit of painting still to do! Good luck and have fun sir! Something's bound to go wrong - it wouldn't be a plan otherwise! So how did Caesar win that again? ?